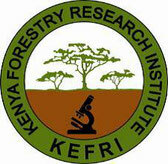 Kenya Forestry Research Institute (KEFRI) is a regionally and internationally recognised public research organisation mandated to conduct interdisciplinary research within the organisation and in collaboration with other partners in forestry and allied natural resources. It plays a leading role in knowledge transfer, training and capacity building of user-oriented research for sustainable development, such as the Annual Regional Training Course on Adaptation to Climate Change in Africa. KEFRI also hosts and leads key international networks, e.g. Network for Natural Gums and Resins in Africa (NGARA), African Forestry Research Network (AFORNET), and Forestry Research Network for Sub-Saharan Africa (FORNESA), Network for Natural Gums and Resins in Africa (NGARA). The institute has a workforce of ~1000 staff comprisng 450 working in five thematic research areas, namely Forest Productivity and Improvement; Biodiversity and Environment Management; Forest Products Development; Social-economics, Policy and Governance, and Technical Support Services. As part of its national capability, it has equipped laboratories and field facilities strategically and ecologically located in five regional centres (Lake Victoria Basin, Rift Valley, Central Highlands, Drylands and Coastal), suitable for multi-site studies.